(Proverbs 4:20-22, 6:2, 18:4) The words of a man’s mouth are as deep waters, and the wellspring of wisdom as a flowing brook. Every word spoken becomes a living thing, to minister or to destroy. (Roman 12:1) Heavenly Father, according to Your Word, I present my body a living sacrifice, holy and acceptable in Your sight. (Isaiah 43:26) And Lord you tell me to put you in remembrance and for us to talk together daily that I may ask and be forgiven of my sins. So I ask you to remember the promises you have for me, as I keep Your commandments and ask forgiveness of my sins. (2 Timothy 1:7) And I thank you that I do not have a spirit of fear, but a sound mind in Jesus name. (Colossians 1:9-11) I desire to be filled with the knowledge of Your will, in all wisdom and spiritual understanding, that I walk worthy of the Lord unto all pleasing, being fruitful in every good work and increasing in the knowledge of God, strengthened with all patience and long-suffering. (Nehemiah 8:10) with joyfulness; for the Lord is my strength. I thank you for the wisdom, knowledge, understanding, common sense and comprehension that you give me in all that I do today. (Ephesians 6:14-17) Father, I gird my loins about with truth, I put on the breastplate of righteousness, and I shod my feet with the preparation of the gospel of peace. Above all, I take the shield of faith, wherewith I shall be able to quench all the fiery darts of the wicked. And I take the helmet of salvation and the sword of the Spirit, which is the word of God. (Isaiah 58:8) And the Glory of the Lord is my rear guard. (Isaiah 61:3) Father, I put on the garment of praise, and thank You for the armor You have provided for me to dress in this day. 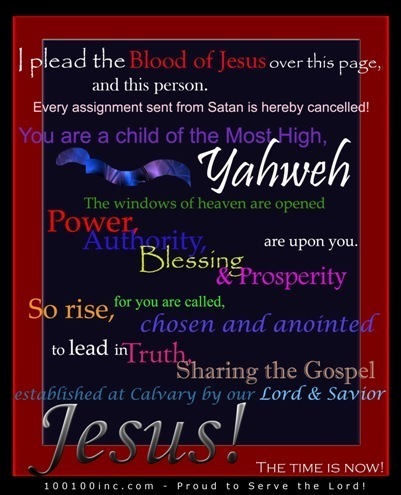 I am completely covered now in the name of Jesus, according to Your word. (Matthew 16:18) Upon Jesus I have built my entire life, and the gates of hell shall not prevail against it. (Philippians 4:13 and 19) I know I can do all things through Christ who strengthens me, and You shall supply all my needs, according to Your riches in Glory. (Job 10:12) I thank You Lord that You have granted me life and favor. (Proverbs 12:2) And you tell me in Your Word that a good man obtains favor from the Lord. (Psalm 5:12) For You, O Lord, tell me that you will bless the righteous, and with favor You will surround me with a shield. So I thank you today, that I have favor from You God, Your Son Jesus, The Holy Spirit, and everyone that I come in contact with today, and forever. (2 Corinthians 10:5) I cast down all imaginations, and bring into captivity every evil thought. (I Peter 5:7) I cast all my care on You, for You care for me. (I Peter 2:24) You tell me that you, yourself Jesus, took my sins on Your body on the cross, so that I who have died to sin, because I have You as my personal Savior, will live for righteousness and by Your stripes I am healed. (Isaiah 53:5) So I thank You and praise You for walking in divine health and prosperity, because of Your stripes I recieve my healing today. (Psalms 103:5) My soul does prosper in you, and You heal all my diseases. (Psalms 107:20) As you have sent your word and gave me good health. (Deuteronomy 8:1) All the commandments, which You have commanded me, I will do, so I may live, multiply, and possess those blessings that You have promised me. (St. John 15:7) For Lord, You tell me that if I abide in You and Your word abides in me, I may ask what I will and it shall be.